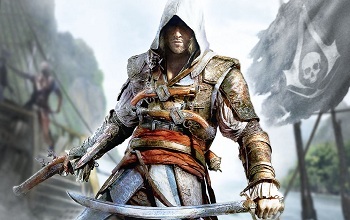 Ubisoft: Assassin's Creed Has "An End"
Assassin's Creed IV director Ashraf Ismail says that each new game is working through a planned overall arc. You could be forgiven for thinking that Ubisoft, the company behind the Assassin's Creed franchise, was perhaps making the series' story up as it went along. How else are you supposed to react to a franchise that began in the Crusades, worked its way to the Italian Renaissance, landed briefly in the American Revolution, and will now transplant its experience in a world of swashbuckling pirates? It's brings to mind a dart board covered in settings and is the sort of storytelling that's hard to see coming to a tidy end. That said, according to Ashraf Ismail, the director of Assassin's Creed IV, the series does have an end point and its creators know what it is. "We have multiple development teams, then we have the brand team that sits on top and is filled with writers and designers concerned with the series' overall arc," explained Ismail. "So there is an overall arc, and each iteration has its place inside this." Whatever this arc may be, it's apparently flexible enough to allow for the annual release schedule that Ubisoft requires of the series. "We are a yearly title, we ship one game a year," said Ismail. "So depending on the setting, depending on what fans want, we've given ourselves room to fit more in this arc. But there is an end." There are some who have suggested that an insistence on regular sequels is inevitably be detrimental to a franchise. That said, Ismail believes that the story being spun in the Assassin's Creed games actually benefits from its regular releases. For instance, developers across separate teams have been able to coordinate new narrative elements across new Assassin's Creeds while they're still in development. "We're now able to seed stuff earlier and earlier in our games," Ismail continued. "So for example in [AC4] we have Edward, who was seeded in AC3. But there's a lot more stuff in our game that is hinting at other possibilities." Possibilities that will doubtlessly be explored in sequels upon sequels to come.